PSA: Terrible Ice Cream Ahead! I'm going to waste as few words as possible on this one. I bought this for a breakfast sundae idea but after trying to choke down a bit of it after dinner, I'm not really sure I want to ruin a sundae with this junk. 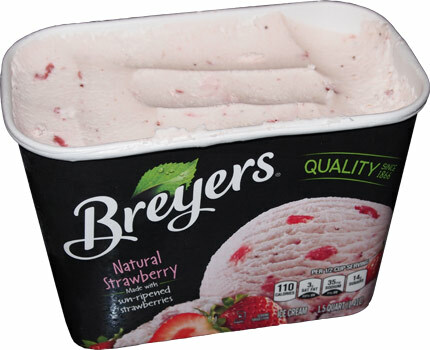 Breyers Naturally Strawberry ice cream is really terrible. It may be made with "sun-ripened strawberries", but it's chalky and nearly flavorless. I'd blame it on a long trip in the freezer, but I just bought this like two days ago. I literally stopped eating it after about 6 or 7 bites. I couldn't even force myself to finish a small bowl of it. It was sweet or sugary or strawberry. It was so bad that I tried to save it by adding in some Edy's and all I did was ruin the Edy's as well. I took this disgusting pile of junk and flushed it down the drain. I can't even remember the last time that I was this immensely disappointed in something. I'm baffled by how bad this was. Did they put in as little strawberry flavoring as possible to save a buck? Did you know that Breyer's sales were down 8% last year? Sure they'll be trying to turn things around with their new gelato line up, but what they need to do is listen to all the angry people on their facebook page and go back to making ice cream the way they use to. No more excuses, listen to the people and let's turn this ship around. Buy Again? I want my money back! On Second Scoop: I was very, very hungry and this 2 month old ice cream was all I had in the freezer. I took a several small bites and maybe I was a bit harsh, but overall my point remains. Why would they make something with such little flavor? With all the people complaining about a lack of mix-ins on Breyers facebook page, you can't help but wonder if the lack of strawberries is related to cost cutting. Edy's really needs to get their act together or else bankruptcy is in their future. I bought the black raspberry chocolate chip was may be the only decent flavor left. Wow! I was not expecting that. I loved their strawberry when I was in my teens 10 years ago. Did they change their recipe? They've tweaked it a few times over the years but this last change is unbearable. Terrible. I just want to throw it in the trash. It's really a shame what's happened with Bryer's. Growing up, it was such a good brand. The only flavor I still like is the natural vanilla. Boycott Unilever. They took a Green Bay delicious institution and killed it to save a few pennies. My last purchase was 2 no longer half gallons of Peach Ice Cream. Brought them home, dished them up and...it wasn't Ice Cream. No one wanted to eat it. Nearly identical packaging as before when it was sooooo good. Turns out you must carefully read the package to see it's really "frozen dairy desert" whatever that is. I took the containers with the "product re-scooped back into them and demanded my money back and I got it. Called Unilever, they could not have cared less. Wanted my name and address so they could send me some coupons for free "ice cream" I told them absolutely not. I need to move back to Ohio where I can get Homemade Brand Chocolate Chip. Best!! I just bought some Breyer's strawberry ice cream a couple of days ago and wish I had read this review beforehand! The strawberry ice-cream is just horrible. I can buy a better Blue Bunny at a lesser cost, but just thought I'd give Breyer's a try. Never again. I just bought Breyers " improved" Mint Chocolate Chip,with " chocolate flavored chips". Who are they kidding ? Unilever is a British - Dutch transnational front for Rothschild's. Absolute evil in action. Boycott everything with that logo.